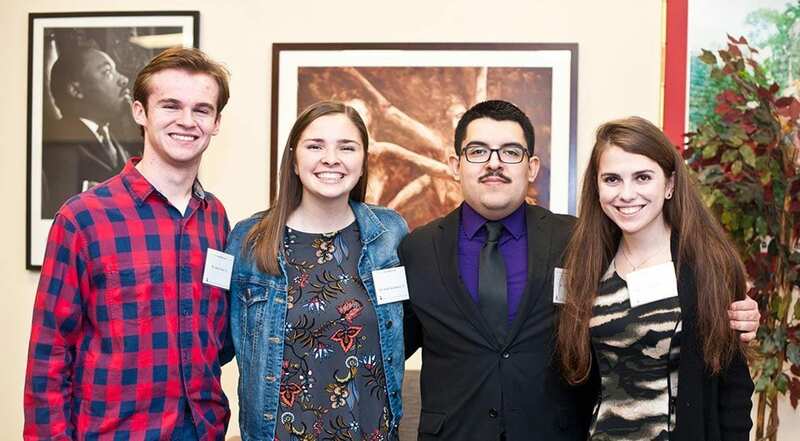 From left, Cristian Arcega with essay contest winners Sean Gray ’21, Katie Iwanowicz ’21, and Claire Stover ’21. 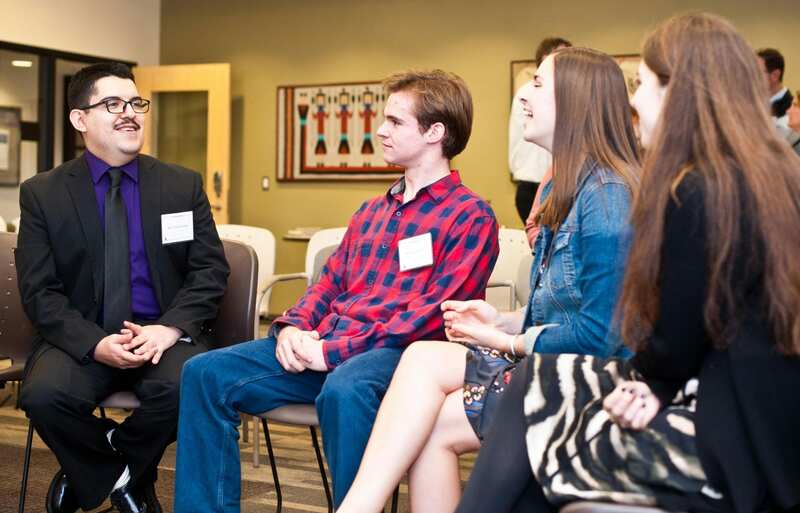 First-year students participating in the Common Reading Program at Providence College had a rare opportunity — they heard the book’s author speak at Academic Convocation in August, then meet one of the main characters during New Student Family Weekend in October. Cristian Arcega was one of four high school students featured in Spare Parts: Four Undocumented Teenagers, One Ugly Robot, and the Battle for the American Dream, a book by Joshua Davis. Arcega was the keynote speaker for New Student Family Weekend, Oct. 27-29, which drew more than 1,600 parents and family members to campus for theatre performances, athletic events, campus tours, panels about study abroad and career preparation, and more. Arcega also shared lunch with winners of the Common Reading Program essay contest and participated in a Faculty Experts Discussion led by Dr. Joseph Cammarano, associate professor of political science and of public and community service studies. Cristian Arcega was one of four high school students featured in Spare Parts, a book by Joshua Davis. Arcega is a “dreamer” — an undocumented person granted temporary legal status under DACA, or Deferred Action for Childhood Arrivals. Created in 2012 by President Barack Obama, DACA gives people brought to the United States illegally as children the temporary right to live, study, and work in America. It was established after Congress failed to pass the Development, Relief and Education for Alien Minors (Dream) Act, which would have offered those same people the chance of permanent legal residency. President Donald Trump announced he will end DACA in March 2018 unless Congress takes action on immigration. College President Rev. Brian J. Shanley, O.P. ’80 announced in September that the College would offer free legal services and cover the filing fees of students applying for DACA renewal before the Oct. 5 deadline. Counseling is also available to assist those students with any needs related to their immigration status, Father Shanley said. Before Arcega’s address, Father Shanley told students and their families that he was impressed by the Spare Parts story because it showed students and teachers working together, and because of the “creativity and grit” the students demonstrated. Using cheap materials they could repurpose or buy through fundraising in their community, Arcega and his classmates built a robot that won a national competition in 2004, defeating MIT students sponsored by Exxon. 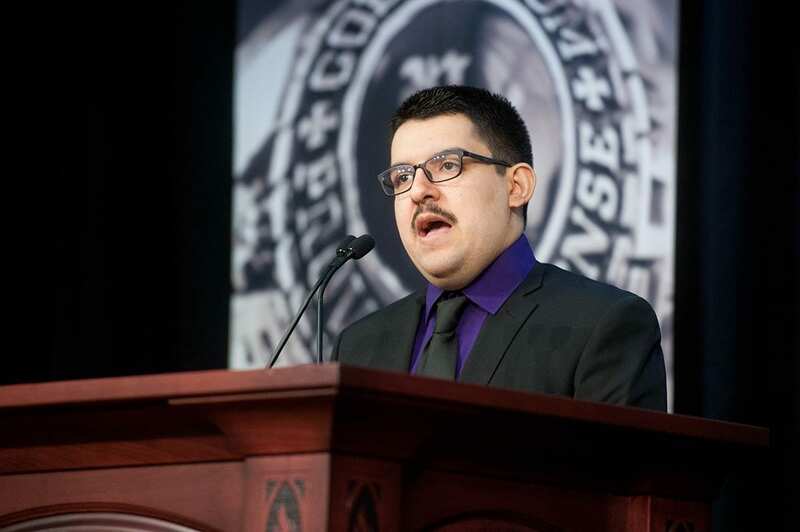 Faced with media attention, the students, all natives of Mexico, had to decide whether “to become the story everyone refers to when talking about immigration reform and the Dream Act,” Arcega said in his presentation. Winners of the Common Reading Program essay contest, from left, Sean Gray ’21, Katie Iwanoicz ’21, Arcega, and Claire Stover ’21. Her father, Jeffrey Stover, said he appreciated being able to hear Arcega. Sean Gray ’21 (Lincoln, R.I.), a humanities major, won second prize for his essay, “Essential Parts,” and attended the lunch with his parents, Mark Gray ’78 and Julie Crowley Gray ’81. His mother also read the book and enjoyed meeting Arcega. “I loved it. It’s timely. It’s just so important for now. And he’s got such a great personality to deliver the message,” she said. “He’s warm and he’s friendly and he’s approachable. 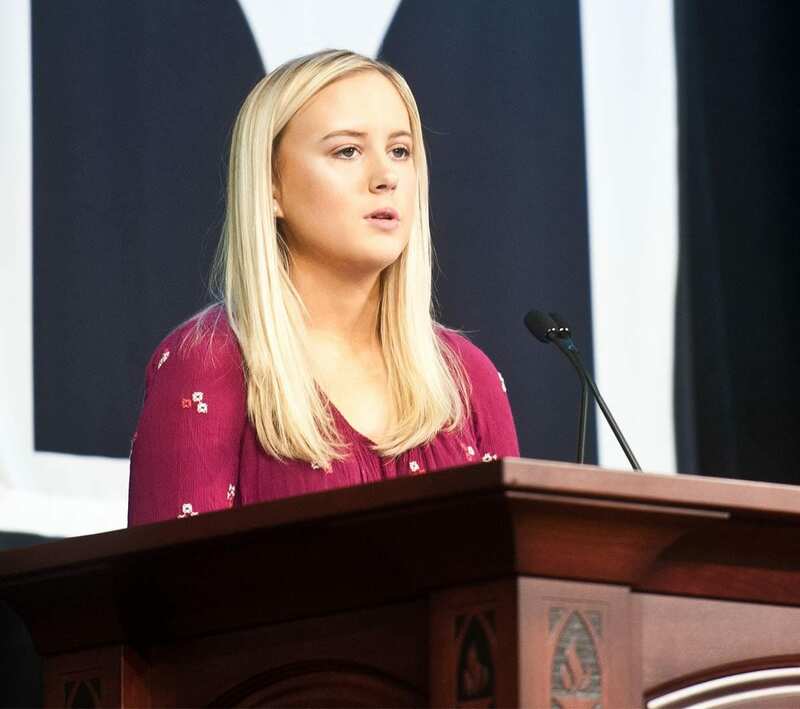 Katie Iwanowicz ’21 (Delmar, N.Y.), a political science major who was awarded third place for her essay, “American DREAMers,” said she asked Arcega how he feels about rhetoric used by Trump. 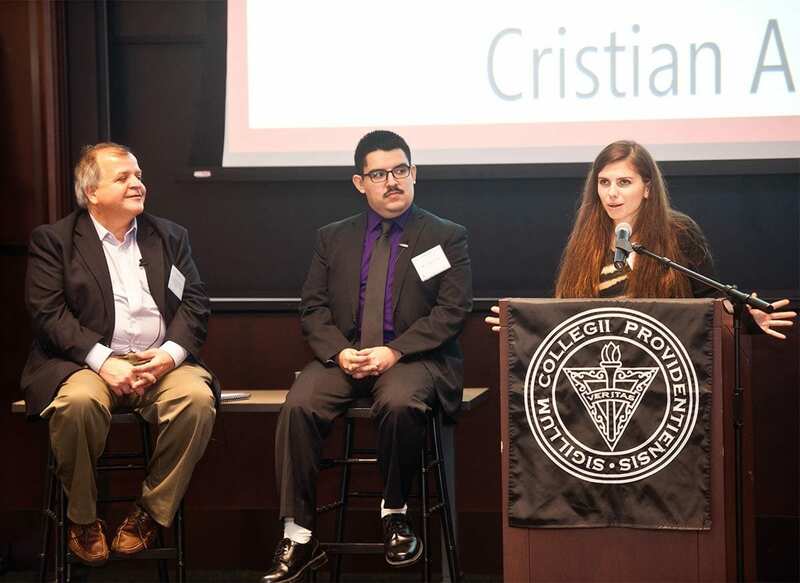 Claire Stover ’21 introduces Cristian Arcega at the Faculty Experts Discussion. At left is Dr. Joseph Cammarano, associate professor of political science and of public and community service studies. Arcega, who was 14 at the time of the national competition, is now 29. He has been recruited by interest groups and lobbyists to speak about immigration reform in Washington, D.C., and he attended a meeting at the White House. He has taken classes at a community college in Arizona, studied mechanical engineering at Arizona State University, studied computer engineering and electrical engineering at Western Michigan University, and attended mechanics school. He has not yet earned a degree, but it is “only a matter of time,” he told Cammarano during the Faculty Experts Discussion. Arcega has withdrawn from college in the past because of a lack of residency and a lack of money to pay for courses. Through DACA, he has a work permit but cannot obtain health insurance. To make students from other cultures feel welcome, it’s a good idea to offer them food from home and a chance to see their families, Arcega said. Arcega said the four students grew accustomed to being the subject of articles and films, including a movie, Spare Parts, based on the Davis book, and a documentary, Underwater Dreams, by filmmaker Mary Mazzio, which was shown during New Student Family Weekend. Emily Powers ’21, president of the first-year class, welcomes students and their families. “There is a place for everybody here,” Powers said. Father Shanley urged parents not to worry about their child’s choice of a major. Increasingly, students in the United States are being urged to study something “practical, that you’re going to get a job with, or think you’re going to get a job with,” he said.